Stock markets in India continued to trade on a positive note in the afternoon session and finished firm for fourth consecutive session. At the closing bell, the BSE Sensex stood higher by 167 points, while the NSE Nifty finished up by 44 points. Meanwhile, the S&P BSE Mid Cap and the S&P BSE Small Cap finished up by 0.5% and 0.4% respectively. Gains were largely seen in pharma stocks, oil & gas stocks and bank stocks. HDFC Bank share price rose to an all-time high after the Reserve Bank of India removed the foreign institutional investor (FIIs) ban limit on the counter. However, HDFC Bank pared gains (finished up by 3.7%) in the afternoon session after the private sector lender crossed overall limit of 74% of its paid-up capital. Asian stock markets finished lower today with shares in China leading the region. The Shanghai Composite is down 0.85% while Japan's Nikkei 225 is off 0.58% and Hong Kong's Hang Seng is lower by 0.31%. European markets are lower today with shares in France off the most. The CAC 40 is down 0.85% while Germany's DAX is off 0.35% and London's FTSE 100 is lower by 0.24%. The rupee was trading at Rs 67.04 against the US$ in the afternoon session. Oil prices were trading at US$ 53.83 at the time of writing. According to a leading financial daily, Bharti Airtel has completed the merger of Augere Wireless Broadband India (Augere), a wholly owned subsidiary with itself. Last year in August, the company had signed a definitive agreement to acquire 100% equity stake in Augere. The deal size is estimated to be around Rs 1.5 billion. Augere is engaged in the business of operating, supplying, managing, dealing and using communication, telecommunication service, telecommunication system etc. as also carrying on the business in the field of providing broadband wireless service, internet service, telecommunication etc. Augere holds 20 Mhz of spectrum in 2,300 Mhz band in Madhya Pradesh service area, which includes Chhattisgarh, to be used for 4G services. The company had won this spectrum for Rs 1.24 billion in 2010 but has not rolled out services. Bharti Airtel share price finished the trading day up 0.9% on the BSE. In another news, Idea Cellular share price plunged 5% before recovering and finished down by 1.7% after it was reported that the company will move out of National Stock Exchange's Nifty 50 index from March 31. Moving on to news from stocks in pharma sector. Sun Pharmaceuticals share price surged and finished up by 4% in today's trade after it was reported that the company's subsidiary received approval for Tobramycin from the European Medicines Agency. The approval for the product was received by company's wholly owned subsidiary firm from the European Medicines Agency. The company and its subsidiaries continue to file multiple products across multiple countries on an on-going basis. Sun Pharma posted a net profit decline of 5% to Rs 14.71 billion in the third quarter ended December as compared to Rs 15.44 billion in the same period previous year. Sales growth in main markets such as the US and India was slower than expected. Sun Pharma's US market sales in dollar terms rose by 4% over a year ago and declined by 9% sequentially. Growth was expected to suffer as the preceding quarter had one month of exclusivity-period sales of the generic version of cancer drug Gleevec. Surprisingly, the India business growth at 5% year-on-year too was lower than expected. While notebandi was expected to hit sales growth, its portfolio tilt towards chronic categories would have protected it to an extent. Normalcy has still not returned and the trade's inability to hold inventory (due to the cash shortage) appears to have affected sales growth. In another development, Lupin share price too finished firm (up 1.2%) after the company received final US Food and Drug Administration (USFDA) approval for ANDA Moxifloxacin Hydrochloride Tablets, 400 mg, generic of Avlox Tablets of Bayer Healthcare Pharmaceuticals, Inc. The company has recently received final approval for its Triamcinolone Acetonide Cream USP, 0.025%, 0.1% and 0.5% from the USFDA to market a generic equivalent of Mylan Pharmaceuticals Inc.'s. HDFC Bank surged more than 9% in the initial hours of trading today after Reserve Bank of India (RBI) removed restrictions on foreign institutional investors for the purchase of its shares. This fueled the Bank Nifty Index rally to touch its life high. The Index opened at 20,918, a 675-point gap up, but it couldn't sustain and dragged down immediately after touching a high of 21,042. This formed a bearish candle for the index on the daily chart. Currently, the index is trading at its strong horizontal resistance level of 20,555. The RSI indicator is also trading at its overbought level of 73.5. The red candle on the daily chart near the resistance level coupled with RSI trading in its overbought level is a sign of concern for the bulls. On the other hand, a sustained close above this level might cheer them. After opening the day on a positive note, share markets in India have continued to trade strong and are trading comfortably above the dotted line. Sectoral indices are trading on a mixed note. With the stocks in the banking sector and stocks in the pharma sector leading the gains. Stocks in the IT sector and the metal sector are trading in the red. The BSE Sensex is trading up by 182 points (up 0.7%) and the NSE Nifty is trading up by 52 points (up 0.6%). Meanwhile, the BSE Mid Cap index is trading up by 0.6%, while the BSE Small Cap index is trading down by 0.5%. The rupee is trading at 67.02 to the US$. HDFC Bank share price surged over 9% in today's trade reaching its record high of Rs 1450. The stock surged after it was reported that Reserve Bank of India removed restrictions on foreign institutional investors for the purchase of shares of the lender with immediate effect. Speaking about our views on HDFC Bank, the stock was recommended by the StockSelect team when the scrip was trading at quite attractive valuations. To know more about our views on the stock, do check our latest update (Subscription required). In news from stocks in the oil and gas sector, state run Oil and Natural Gas Corporation (ONGC) announced its planned capital expenditure for the 2017-18 fiscal. ONGC aims to spend over Rs 290 billion in FY 2017-18, similar to the capex planned for the current fiscal year. According to ONGC, the planned capital expenditure will go towards developing its offshore oil and gas fields. Though the expenditure would be similar to that was planned for this year, the physical activity would be more next year since the cost of services has fallen. The cost of rigs and many oilfield services have fallen by about 25-30% in two years since the crude oil price slumped, benefitting explorers and producers such as ONGC. The capex for the next fiscal year doesn't include the $1.2 billion, or Rs 80 billion, ONGC has to pay for the purchase of Gujarat State Petroleum Corp's stake in the KG Basin asset. ONGC will meet its funding requirement through internal resources. The company is aiming to spend Rs 293 billion in FY2016-17. In the first nine months, it has used up Rs 19,000 crore, or about two-thirds of its target, which is at a slower pace than some of its peers that have already exceeded annual targets. The next fiscal could signal a world of change in India's oil and gas sector as the government envisions the creation of an integrated public sector 'oil major' which will be able to match the performance of international and domestic private sector oil and gas companies. The resulting entity from the consolidation of India's major oil & gas PSUs will create an oil major which could top over US$ 100 billion in market revenue. Consolidation to Lift the Oil and Gas Sector? It remains to be seen how the government moves forward with this proposal. The short term and long term implications of a merger of this scale will be a key thing to watch out for. Moving on to news about the economy. The tenth meeting of the Goods and Service Tax (GST) council, is set to be held tomorrow. The states and the Centre will meet on Saturday to vet the draft supporting legislations crucial for the implementation of GST. With a consensus on all the contentious issues, including on sharing of administrative powers between the Centre and the states, the Centre is hopeful that the 10th meeting of the GST council will give its nod to the final drafts of all the legislations-the central GST bill, the state GST bill, the integrated GST bill and the bill to compensate states for revenue losses arising from a transition to GST. The council's nod will pave the way for three bills to be tabled in Parliament in the second half of the budget session beginning 9 March and for the state GST bill to be passed by respective state assemblies. Passage of the bills at the earliest will be imperative for the government to meet its revised GST implementation deadline of 1 July 2017. GST will subsume a host of indirect taxes levied by the center and the states, including excise duty, service tax, value-added tax, entry tax, luxury tax and entertainment tax. A transparent tax regime may very well be beneficial to the investors, individuals and businesses. It all paints a rosy picture, but in the long term it may not be the case. Vivek Kaul has a special report ready, which will help you understand how GST actually affects you. You can download this special report - GST & You, for free right here. After opening the day on a positive note, the Indian share markets have continued their momentum and are presently trading in the green. 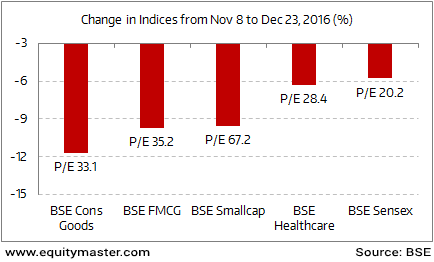 Sectoral indices are trading on a mixed note with stocks in the banking sector and healthcare sector witnessing maximum buying interest. IT stocks are trading in the red. The BSE Sensex is trading up 212 points (up 0.8%) and the NSE Nifty is trading up 50 points (up 0.6%). The BSE Mid Cap index is trading up by 0.5%, while the BSE Small Cap index is trading up by 0.6%. The rupee is trading at 67.03 to the US$. HDFC Bank share price surged 8% in opening trade after it was reported that Reserve Bank of India removed restrictions on foreign institutional investors for the purchase of shares of the lender with immediate effect. In the news from global financial markets, Japan's economy expanded at a steadily slowing pace during the last three months of 2016. Data released showed Japan's GDP grew at an annualised 1% in October-December. The preliminary reading for fourth-quarter GDP figure translated into 0.2% growth on a quarter-on-quarter basis. As per the data, a weaker yen supported exports of the country. However, tepid private consumption and the risks of rising US protectionism continued to weigh on a sustainable recovery. External demand contributed 0.2% point to GDP, with exports rising 2.6%. This was the fastest growth in two years and was largely driven by shipments of cars to China and the US, and those of electronics parts to Asia. Private consumption, which accounts for roughly 60% of GDP, showed no growth. The data suggested that rising food prices dented households' purchasing power. The Bank of Japan (BoJ) now sees real GDP growth of 1.5% in the 2017 fiscal year. This is up from its previous forecast of 1.3% offered in November last year. We believe there's a big crisis brewing within Japan. In fact, if there's one place on this planet that epitomizes all the wrong kinds of growth, it's Japan. Too much money printing...too much debt...too much government intervention...too much stock market manipulation. Sooner than later, these easy money measures by central bank are going to end. And as per Asad, the end of easy money policies will create some big trends that traders can profit from. Speaking of trading, our colleague Apurva Sheth of the Profit Hunter team released a detailed report on trading stocks. The special report talks about what he believes could be extremely effective stock trading strategy. Most importantly, the strategy could be implemented in four easy steps. Get your hands on this report right now. In the news from domestic markets, Reserve Bank of India (RBI) Governor Urjit Patel has stated that India's growth will bounce back after a sharp slowdown triggered by government's notebandi. The governor said that the benefits of the notebandi drive will take time to fully play out and need more work to ensure they're lasting. As per him, remonetisation has happened at a fast pace and that was part of the plan. 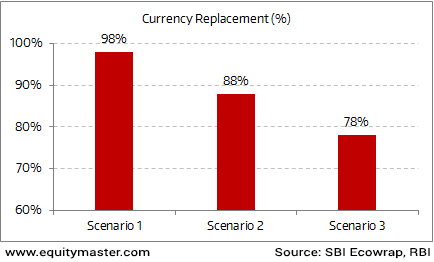 However, if one has to look at the data, re-monetisation is where things really fell apart. According to an article in the Mint, as of January 2017, the total currency in circulation is 57% of what it was before notebandi. In fact, as per RBI data, the cash with public is 40% less than what it was one year ago. So going by the ground realities, the economy is still facing troubles for the notebandi drive initiated by the government. The government will continue with its lies to tell us that all is well on the notebandi front, but that doesn't make the situation any better for the common man. Asian equity markets are under pressure today as Chinese and Hong Kong indices opened lower. The Shanghai Composite is off 0.30% while the Hang Seng is down 0.44%. The Nikkei 225 is trading down by 0.57%. Share markets in the US & Europe ended their previous session on a weak note. Meanwhile, share markets in India have opened the trading day firm. The BSE Sensex is trading higher by 262 points while the NSE Nifty is trading higher by 67 points. The BSE Mid Cap index and BSE Small Cap index both have opened the day up by 0.3% & 0.4% respectively. Sectoral indices have opened the day on a mixed note with information technology stocks and capital goods stocks witnessing selling pressure. While, banking stocks and healthcare stocks are among the top gainers on the BSE. The rupee is trading at 66.95 to the US$. HDFC Bank share price surged 8% in opening trade after it was reported that Reserve Bank of India removed restrictions placed on foreign institutional investors on the purchase of shares of the lender with immediate effect. RBI in notification stated that the aggregate foreign shareholding through American Depository Receipts (ADR)/Global Depository Receipts (GDR)/ Foreign institutional Investors (FIIs)/Foreign Portfolio Investors (FPIs)/ Foreign Direct Investment (FDI)/Non-Resident Indians (NRIs)/ Persons of Indian Origin (PIOs) in M/s HDFC Bank Ltd. have gone below the prescribed limit stipulated under the extant FDI Policy. Hence the restrictions placed on the purchase of shares of the above company are withdrawn with immediate effect. Foreign ownership in private banks is restricted to 74 per cent, a limit which is periodically reviewed by the Reserve Bank. Housing Development Finance Corporation share price too surged and was trading up by 1.6% in early trade. Pharma stocks have opened the day on a positive note with Elder Pharma and Cadila Healthcare being the most active stocks in this space. Cadila Healthcare share price staged a swift rally (surging 3.6%) after it was reported that its manufacturing facility in Moraiya, Gujarat was inspected by the US Food & Drug Administration (USFDA). Reportedly, USFDA inspected company's Moraiya facility from 6 February 2017 to 15 February 2017. At the end of the inspection no observation (483) was issued. An FDA Form 483 is issued to firm management after an inspection when an investigator(s) has observed any conditions that in their judgement may constitute violations of the Food Drug and Cosmetic (FD&C) Act and related Acts. In the meanwhile, Dr Reddy's Laboratories has received an unfavourable ruling in the US court regarding a patent infringement case over anti-nausea injection Aloxi. According to reports, New Jersey-based Medicines Co. has filed a suit in a US court alleging Dr. Reddy's is infringing upon its patent to make the generic version of bivalirudin. The drug used as an anticoagulant in angioplasty procedures. Notably, Aloxi accounts for sales of around US$ 600-650 million in the US. To be sure Dr Reddy's received an approval for generic Aloxi from the USFDA in March 2016, after it settled patent litigations relating to its anti-nausea injection Aloxi. "That's how the innovators in the pharmaceutical industry work. They make heavy use of patents whenever they create a new drug. The patent allows them to recoup the high capital expenditure that goes into the research and development (R&D) of new drugs. Companies that have a patent on a particular product are immune from competition for the duration of the patent." However, the settlement will allow Dr Reddy's to market the generic version of Aloxi in the US, the reports noted. In one of our editions of The 5 Minute WrapUp, we wrote about the USFDA crackdowns faced by the Indian Pharma in the recent times and how they have been constantly investing towards R&D. We believe pharma companies that are upgrading and keeping facilities compliant, and have niche product pipelines in place will see sustained revenue growth going forward. Dr Reddy's Lab share price opened the day down by 0.4%. Moving on to the news from automobile stocks. As per an article in a leading financial daily, Tata Motors and Microsoft India have entered into a partnership for the latter's Connected Vehicle Platform. The partnership will work on solutions for inter-connectivity in cars, autonomous vehicle technology and other services. Under the partnership, Tata Motors will offer a digital driving experience which will allow drivers and travellers advanced navigation, predictive maintenance and vehicle-centric services, remote monitoring of car features, external mobile experiences and over the air updates. These offerings will be powered by Microsoft Azure cloud and services such as advanced analytics, machine learning, internet of things and artificial intelligence. The two companies began working with each other last year. This move will help it make future proof cars in India which in some ways promote the Make in India campaign as well. In a bid to make cars for the future, the company is poised to get into a tie-up with global technology major Microsoft. With large auto makers already investing in these emerging technologies, it is clear that Tata Motors needs to make the move quickly to avoid losing out the race particularly when also technologically assisted driving can soon become a reality. To know more about the company's financial performance, subscribers can access to Tata Motors' latest result analysis (subscription required) and Tata Motors stock analysis on our website. What Lies Ahead for Indian Exports? After drowning in demonetisation blues, there's a breath of air for Indian exports, which have apparently grown impressivley during the month of January. Merchandise exports grew 4.3% year-on-year (YoY) to US$22 billion, probably due to improved demand from the US, Europe, and Japan. Further, oil exports also rose by 29% to US$ 2.7 billion, while non-petroleum exports rose by 1.6% on a YoY basis. The above data has lit optimism among business circles and many expect the trend to continue into the following months. Some threats that can disrupt this momentum are global volatility, and protectionist and anti-trade sentiments in the US and Europe. If you look at long term performance, Indian exports have been on a major slide. Demand slowdown in developed economies, lack of competitiveness, increasing competition from other developing countries, an over-valued currency, etc are some of the factors to blame for this slowdown. These factors have more or less remained the same. Apart from that, limited diversification of India's export basket has led to a decline in Indian exports over time. So how can India rise to its potential in this regard? One way to improve India's competitiveness in exports can be reducing corruption and streamlining bureaucratic procedures. But that alone won't be enough. To improve its competitiveness, India should be a part of global supply chains. Along with that, it also needs world class export-related infrastructure. At a time when the world is heading towards protectionism, India needs holistic reforms to become the factory of the world.